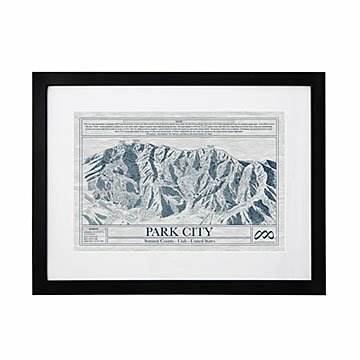 Sentimental skiers can take their favorite slopes home with this blueprint-inspired art. Note: Don't see your favorite resort listed? Keep checking-- we'll be adding more soon. Check out our smaller version of the Ski Resort Blueprints here! My son will use the hot sauce and display the picture proudly!!! This was the perfect gift for the man who has nearly everything. An exceptional piece of art that truly suits a professional office and gives our boss a reminder of a beautiful place where he has made wonderful memories. My boyfriend loved it. The frame is a little cheap looking, but over all this print is nice. Purchased this for my husbands office. Thought it would be a nice unique piece since we often visit and ski in Park City. Looks great on the wall, my husband really liked it. Quality is good. Not excellent but very good. I say this because the glass is a plastic plexi-glass type material but it does not take away from the piece. We are happy with purchase.